During the Independent Activities Period (IAP) in January, MIT’s Kinaesthetics Lab was issued a four-day mechanical-engineering challenge. It wasn’t to design a solar-powered car or a remote-controlled robot, however, but to build a swaying dance platform. 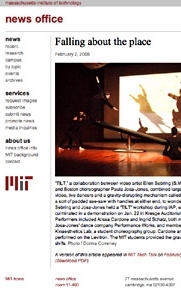 The Kinaesthetics Lab, you see, is a student choreography group. 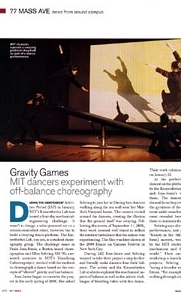 The challenge came as Paula Josa-Jones, a Boston-based choreographer, and Ellen Sebring, SM’86, a research associate in MIT’s Visualizing Cultures project, worked with the students to choreograph a dance based on the concepts of “altered” gravity and lost balance. Josa-Jones began to conceive the project in the early spring of 2001. She asked Sebring to join her in filming two dancers walking along the sea wall near her Martha’s Vineyard home. The camera circled around the dancers, creating the illusion that the ground itself was swaying. Following the events of September 11, 2001, their work seemed well times to reflect the internal turbulence that the nation was experiencing. The film was later shown at the 2004 Dance on Camera Festival in New York City. During IAP, Josa-Jones and Sebring wanted to take their project a step further and literally make dancers lose their balance. The artists and the Kinaesthetics Lab students explored the mechanical aspect of balance as well as the artistic challenges of blending video with live dance. Their work culminated in a performance on January 22. At the performance, two women danced on the platform, which was rocked by the Kinaesthetics students, as Sebring and Josa-Jones’ video played behind them. The dancers’ movements were dreamlike as they swayed with and against the gyrations of the platform. Only their tense ankle muscles and hasty foot placement revealed how difficult it was for them to maintain their balance. What happens when a choreographer pulls the floor out from beneath her graceful, agile, well-trained dancers? What happens when gravity shifts beneath their feet? "TILT," a new collaboration between video artist Ellen Sebring (S.M.VisS 1986) and acclaimed Boston choreographer Paula Josa-Jones, explores that new frontier. The performance combines large-screen video, live dancers, and a gravity-disrupting mechanism called a "levitron" to discover new realms of movement. Starting Sunday, Jan. 16, the artists will conduct a four-day workshop for students to create performance elements for "TILT," including choreography, lighting and a rudimentary levitron designed by Geoff Benson. The workshop will culminate in a lecture demonstration on Saturday, Jan. 22 at 3 p.m. in Kresge Auditorium. Performers will include Alissa Cardone and Ingrid Schatz, both members of Paula Josa-Jones' dance company Performance Works, and members of MIT's Kinaesthetics Lab, a student choreography group. The performers will experiment with ways to mirror on stage the tilt effect, which was created by camera movement in the videotape. Sebring notes that when gravity is disrupted, the dancers are thrown out of balance, evoking new types of dance movement. "We hope to get some ideas as to how to build a more sophisticated levitron in the future," she said. 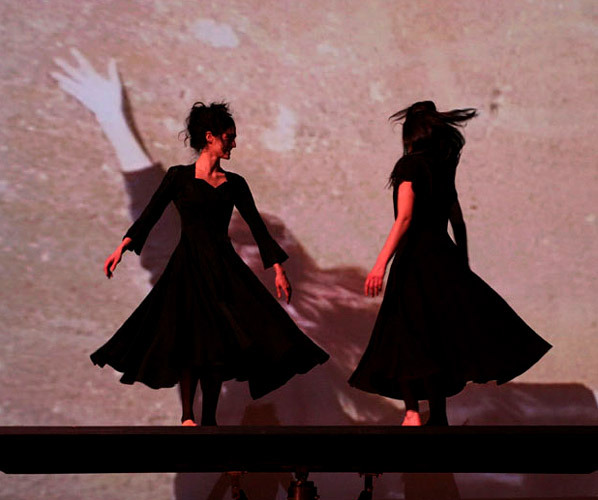 Josa-Jones and Sebring have collaborated for the past 15 years on a wide range of works for dance and film. Most recently, they created a video version of "RIDE," Josa-Jones' work for dressage horses and dancers currently under development as a Broadway-style production. 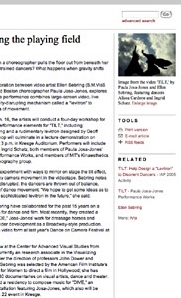 "TILT" was shown in video form at last year's Dance on Camera Festival at Lincoln Center. Sebring was a Fellow at the Center for Advanced Visual Studies from 1987-1993 and is currently an research associate in the Visualizing Cultures project under the direction of professors John Dower and Shigeru Miyagawa. Sebring was selected by the American Film Institute's Directing Workshop for Women to direct a film in Hollywood; she has directed more than 30 documentaries on visual artists, dance and theater. In 2004 she received a residency to compose music for "DIVE," an interactive video installation featuring Josa-Jones, which also will be screened at the Jan. 22 event in Kresge.